"On another seal, No. 510 [in Mackay], a buffalo appears to have attacked a number of people who are lying on the ground around him in every conceivable attitude," writes the excavator Ernest Mackay. "It is undoubtedly the wild rather than the domesticated species that is represented in on this seal, an altogether finer animal which stands 16 to 16.5 hands high at the shoulder. Unlike the domesticated variety, it is very truculent and when wounded is very savage; it was, therefore, a fitting vahana or vehicle for Yama, the god of death. 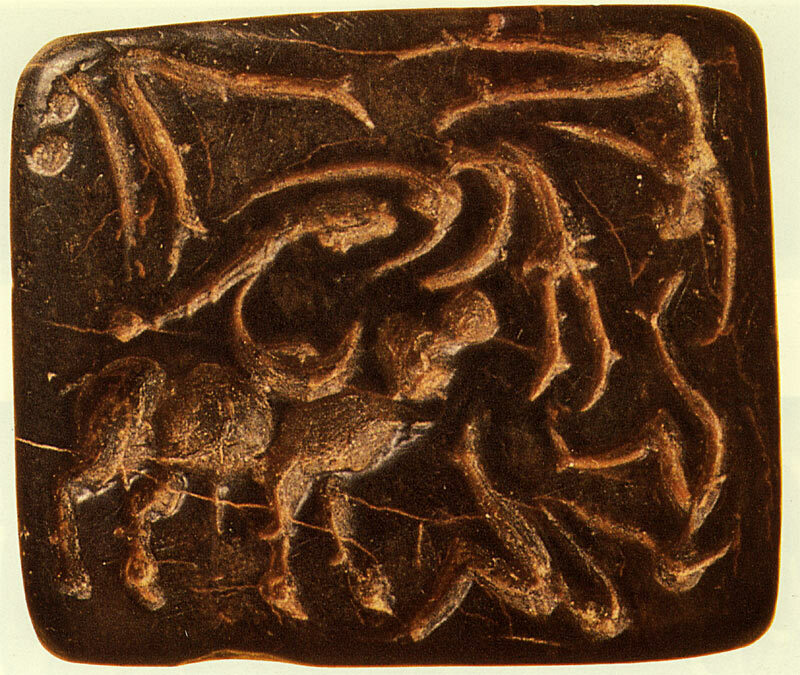 "The little drama depicted on this seal may represent an episode that actually occurred to some of the inhabitants of Mohenjo-daro; the buffalo may have been hunted in Sindh in ancient days. But we may perhaps see in this scene a god, or the emblem of a god, attacking his enemies, a parallel to the well-known scene on the slate palettes of the First Dynasty of Egypt, where the king himself in his attribute 'Strong Bull' gores a prostrate enemy." A little while later Mackay also seems to related the scene with men "vaulting over the animal as in a sport that was much favoured in Crete [a large Greek island] in early times," a sport which we is not unfamiliar, as has been pointed out here, to games in South India. What do you think? Game or Hunt? Ernest Mackay, Further Excavations at Mohenjodaro: Being an Official Account of Archaeological Excavations at Mohenjo-daro, 1938, pp. 336-7.